Am I the only one that gets intimidated by baked potatoes? I love to eat them, and I know they’re NOT difficult to make, but for some reason I just never seem to make them at home. I mean, I’ve made macarons before but I can’t handle a potato? This Loaded Baked Potato Casserole is like the delicious inside of a baked potato without actually baking a potato! 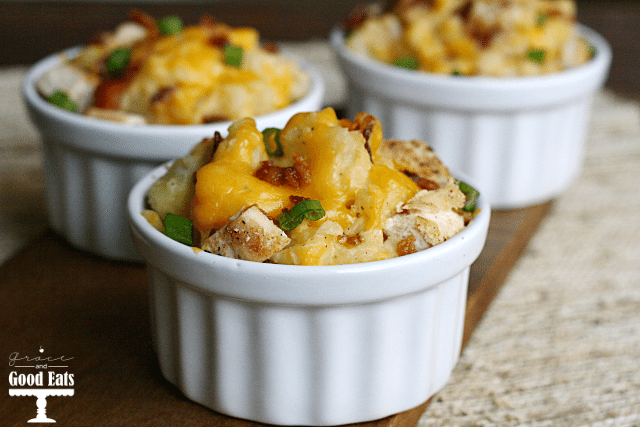 It’s full of cheese, bacon, and chicken all surrounded by creamy, buttery chunks of potato. This dish can be made in to one big casserole or individual servings. We do casseroles a lot, so sometimes it’s fun to do things a little differently. Serves these loaded baked potato casseroles on the side of chicken or steak. Peel and cut the potatoes into large chunks. Place potatoes in a medium pot, cover with cold water, and bring to a boil. Add 2 tsp salt, reduce heat and simmer until just tender, but not falling apart. (About 15 minutes.) Drain and transfer to a large bowl. Add the cream and butter to the potatoes, roughly mash with a fork (leaving some chunks). Add the chicken, scallions, bacon, 6oz cheese, salt and pepper to the potatoes. Mix well to combine. Transfer to a shallow baking dish or 6-8 large ramekins. The recipe sounds good, but a temp to bake the ramekins in is needed. There’s the temp for the bacon, but not the dish it’s self. That’s all I had to comment on. This looks like a dish that I could totally get hooked on! Love this! And love that you broke them out into individual portions. As a household of two, we struggle with having two many leftovers. May try this recipe with a sweet potato as well to see how it is. You had me at bacon, but then I had to click on your post and now I’m drooling! Your loaded baked potato casserole looks SCRUMPTIOUS! Pinning and sharing! Thank you so much for linking up to The Wonderful Wednesday Blog Hop! What a great side dish! I have to make them sometime soon. Things are so much cuter in individual little dishes! These look delicious. I love all of the flavors in loaded baked potatoes and the chicken would be a great addition! I totally understand when you say intimidated! I am the exact opposite though…scared of macarons but can make a baked potato all day long 🙂 Thank you for sharing! This looks delicious! This has my name written all over it! 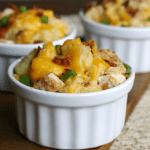 I LOVE anything to do with potatoes, and these are such cute stuffed casseroles – no sharing needed! (Though can I have two just for me?) I love that it can also use some rotisserie chicken and broccoli – two of my favorites. Seriously, it’s like you made it just for me 😉 Pinning, yumming and can’t wait to try!